Welcome to Century Resort Corfu, We would like to invite you to explore our resort here, before having the pleasure of experience the luxury of Century Resort in person. Our spectacular four-star resort is located in the northern region on the beautiful island of Corfu. Century Resort is situated in the picturesque village of Acharavi. The 8 km long beach of Acharavi is just 10 minutes walk from the hotel's entrance. The Hotel is made up of 82 luxurious villas, apartments and studios that share a fascinating view of the sea, swimming pools, or the hotel's magnificent gardens. Century Resort is noted for its high-class ambiance and 30,000 square meters of glorious gardens. Families with children and couples on a romantic getaway who seek "paradise on earth" and relaxation, will love Century Resort. For that very reason, we have hotel guests returning year after year. If your are looking for relaxation on the greenest island of Greece and high class service, seek no further. The Resort has a lot to offer to the whole family. Enjoy playing table tennis, take a dip in the main swimming pool or accompany your children at the playground and children's pool. You can relax by the pool and soak up the sun, while enjoying a soothing drink or salad from the poolside Snack Bar. Our Villas, Apartments and Studios comprise of either 1 or 2 bedrooms, equipped with Satellite TVs, hair dryers, direct dial telephones, dial-up Internet access, independent air-conditioning units, refrigerators and fully operational kitchenettes with dining areas. All apartments and studios have one bathroom, villas have two bathrooms, and Jacuzzis are available in selected apartments. 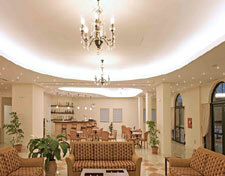 The Main Building houses the reception area that is equipped with high speed WiFi Internet access. At the reception desk you can rent a car or bike for venturing around the island and get additional information about Corfu Island. The main building has a Lobby Bar with Satellite TV, convention area fully equipped for special occasions, such as watching sports events and a restaurant that serves a vast breakfast buffet every morning from 8 to 10:30. Don't miss the balcony's magnificent view of Acharavi's beautiful beach and sunsets. Come stay at Century Resort, a beautiful resort that offers relaxation and a holiday to remember.